'Relaxed, enjoyable and worthwhile' - that's how one of our Big Local ambassadors described London Spring Event! More than 180 people from over 50 different Big Local areas have attended across our first two Spring Events this year, in Sheffield and London. 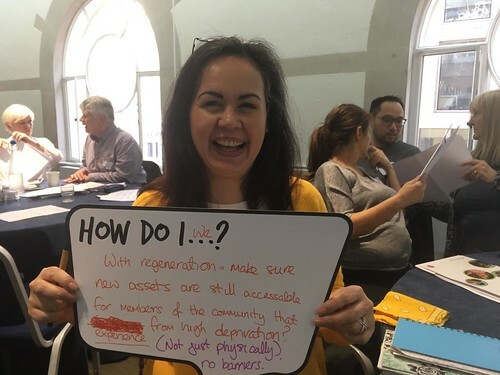 It's all been about learning from each other, and whether you were there or not, you can get ideas for your Big Local area by checking out the resources from Spring Events so far: we've shared presentations, photos, tweets, videos and fabulous 'visual minutes' like the ones pictured above. Newcastle Spring Event is coming up this Thursday, then Manchester Spring Event on Saturday 7 May and Bristol Spring Event on Tuesday 10 May. We're still taking bookings for Manchester and Bristol but with limited places remaining you'll need to be quick: contact 020 3588 0565 or info@localtrust.knightstudiosdevelopment.com to reserve your place. This month we've also been at the House of Lords learning from inspirational local campaigners, and our partners at UnLtd have shared great advice from social entrepreneurs in Big Local areas. Manchester Spring Event, Saturday 7 May, highlights include: Learn how to speak up with confidence; hear how Sale West Big Local support families on low incomes; find out how Brereton Big Local get 3,000 people to their events. Click here for full details on Manchester Spring Event. Bristol Spring Event, Tuesday 10 May, highlights include: Discover ways to get more people involved in volunteering; talk about community food projects with Radstock and Westfield Big Local; find out how Lawrence Weston Big Local have set up an employment and enterprise hub. Click here for full details on Bristol Spring Event. Local economies event: Collyhurst Big Local will share their learning from developing their own community economic plan - they've been able to understand more about their council’s economic goals and planning, and how they could act as a more equal partner in future economic development. Monday 16 May in Manchester. Read more. Big up your local high street: Find out how an ex-Portas pilot area London Road, Brighton has started to overcome issues that may be similar to those in your area. Friday 20 May in Brighton. Read more. Working brilliantly as a group: This course explores common problems in group dynamics and the attitudes and skills that can be used to solve them. Tuesday 24 May in London. Read more. Being the best me: This course allows you to explore what it is you want, what gets in the way of you feeling confident and how you can build your confidence. Monday 6 June in Liverpool. Read more. Big Local and European funding opportunities: EU funding and citizenship programmes offer an exciting opportunity for Big Local areas. Find out how they could enhance Big Local residents’ involvement and lever in extra funds to your area. Tuesday 7 June in Keighley. Read more. Local Trust is a proud sponsor of SMK Campaigner Awards this year, supporting the local campaigner category. Big Local ambassador Ellen Burns-Pearce, from Scotlands and Bushbury Hill Big Local in Wolverhampton, came to the House of Lords in London to present the award to winner Cait Read. Cait is a Newcastle resident who ran a successful campaign to keep Newcastle Turkish Baths and City Pool open. Read more. 'Your idea, your guide' is a new, accessible tool that potential and existing entrepreneurs can use to develop their ideas, featuring lots of video advice from Big Local Star People. Read more. In the press, Big Local ambassador Ralph has been sharing why resident-led change works in Sale West, and Big Local ambassador Lianne has been explaining what Clubmoor Big Local have been doing to support people into employment. We want to find out partnership members’ views on what’s working and what isn’t in Big Local so we can better support Big Local areas in the future. We're asking partnership members in all Big Local areas to complete our survey. If you're a Big Local partnership member, look out for a link to the online survey arriving in your inbox soon. You'll also be able to complete the survey on paper or by phone if you prefer, just call 020 3588 0565.